Central pontine and extrapontine myelinolysis (CPEM) are recognised complications of hyponatraemia and its overly rapid correction.1 CPEM usually presents with spastic tetraparesis and pseudobulbar palsy.1 We describe a patient with CPEM in whom behavioural manifestations overshadowed corticospinal tract signs. A 64 year old Chinese speaking woman with a history of episodic psychotic depression that had never required admission to hospital was admitted to a hospital because of vomiting and diarrhoea. Her general and neurological examination were normal. On admission she had a sodium concentration of 105 meq /l. An infusion of 3% saline at a rate of 150 ml/ hour was given during 6 hours. Ten hours later her sodium was 134 meq/l and she was mute and tetraparetic. She seemed catatonic with motor perseveration. Transfer to our hospital was requested. (A) Axial T2 weighted image showing prominent high signal intensity within the pons suggestive of central pontine myelinolysis. 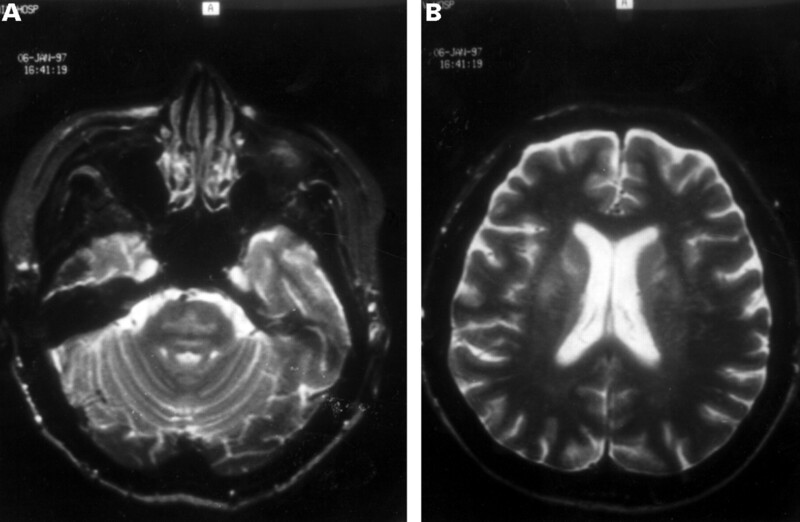 (B) Axial T2 image showing symmetric bilateral areas of high signal in the caudate and putamen suggestive of extrapontine myelinolysis. On admission her vital signs were normal. She was mute without any spontaneous volitional movements except for visual pursuit. She was tetraparetic and hyperreflexic with increased tone and bilateral Babinski’s signs. CPEM was suspected. Admission MRI, EEG, and spinal fluid examination were normal. Over the next 2 days the reflexes normalised and the Babinski’s signs disappeared but she continued to have mild diffuse weakness. She had waxy flexibility and assumed bizarre non-physiological postures consistent with catatonia. Psychogenic unresponsiveness was suspected and she was started on risperidone and sertraline. There was no benefit. Electroconvulsive therapy was proposed by a psychiatry consultant but was refused by the patient’s family. The clinical picture was dominated by an akinetic mutism with marked catatonia. Catatonia due to CPEM was considered. A repeat MRI 12 days after the onset of symptoms showed high intensity areas in the pons, caudate, and putamen consistent with CPEM (figure A, B). Physical and occupational therapy were instituted and she gradually recovered over the next 2 weeks. She was transferred to a rehabilitation hospital where she recovered completely and returned to live independently. She has been followed up at the neurology clinic and has not shown any residual deficits. CPEM usually presents with tetraparesis and pseudobulbar palsy. Unusual clinical presentations include extrapyramidal syndromes, ataxia, and neurobehavioural syndromes. Although psychiatric manifestations of CPEM have been recognised they usually manifest as an agitated delirium, or a pseudobulbar state with pathological laughing and crying.1 When present, neuropsychiatric symptoms are usually overshadowed by florid signs of brainstem and pyramidal tract dysfunction.2 3 Behavioural changes such as inappropriate affect, emotional lability, personality changes, paranoia, poor judgement, emotional incontinence, and disinhibition have been reported.1 2 Price and Mesulam described a case of pontine myelinolysis in which transient pyramidal signs were followed by confusion, restless behaviour, pressured tangential speech, and disinhibition.2 Our patient also had transient long tract signs but they were followed by a catatonic state. The extensive extrapontine myelinolysis present in our patient may explain the behavioural symptoms we encountered. CPEM may present with unusual behavioural symptoms. At the onset of neurological deterioration MRI may be normal but subsequent imaging studies usually disclose the lesions. CPEM presenting with neuropsychiatric symptoms in patients with normal initial imaging studies might suggest a psychogenic aetiology. Corticospinal tract signs may be temporary. A strong index of suspicion for CPEM is required when patients with recent hyponatraemia present with behavioural changes. Akinetic mutism and catatonia may be the dominant clinical features in CPEM. (1993) Pontine and extrapontine myelinolysis. Pontine and extrapontine myelinolysis: a neurologic disorder following rapid correction of hyponatremia. Medicine 72:359–373. (1987) Behavioral manifestations of central pontine myelinolysis. Arch Neurol 44:671–673. (1997) Myelinolysis after correction of hyponatremia. Ann Intern Med 126:57–62.